Apologies I've been M.I.A this week. I headed to Sydney for some work for my day job which was actually really good and quite inspiring. It's also given me clarity of the year ahead from both a personal and professional persepctive. I love Sydney, I really enjoy heading over for a few days. There's an energy about Sydney that you can't find anywhere else. I usually take the red eye flight over as it gives me a good full day in Sydney on the other end. It's a good flight option from Perth IF you can grab a couple of hours of shut eye during your flight. I arrived early and met up with a friend, fellow blogger and photographer, Clayton of What Men Should Smell Like to grab some breakfast at The Grounds of Alexandria (so yummy). There's also this great place there called Salt Meat Cheese, so very cool and the kind of retailing I like. I had no idea there were this many varieties of salt! We then moved on to have a gorgeous picnic at Elizabeth Bay Park. The weather was divine, the park perfect by the water and most importantly got to catch up yet relax with some great friends. I also finally got a to chance visit Chinese-Cantonese restaurant, Mr Wong's. I loved the decor and ambience and the food was good, not great but it was good. 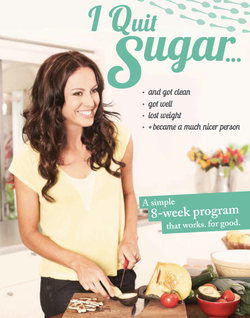 But just before I flew out to Sydney, I downloaded Sarah Wilson ebook "I Quit Sugar". This is something I've been pondering for sometime now so I thought I'd have a read through. And now have decided to give the 8 weeks to quit sugar a go. I'm always thinking it is my diet and of course sugar. I eat way too much sugar - and I'm not just saying that. The foods I eat are full of sugar, and bad sugar at that. it's an experiment, just give it a go just to see how you feel. Whilst you may lose some weight along the way, it's not a diet. I feel at this point in my life I really need to challenge myself to something and that is for me, not for anyone else or for work, just me. I am intrigued by the simple fact of about how I feel. So the first week or two is really about starting to be more aware of the sugar you're eating and start to make some better choices. So that's what I've done this past week and will do again this week. I've had no chocolate, no soft drinks, no sugar in my tea or coffee, no white bread and pastas and I'm researching. My next shopping list includes quinoa, chia, lots of vegetables. (for the 8 weeks, I'm not eating any fruits as they contain fructose). I actually can't wait and am excited about trying something new for the year that is to help make me feel better. It's not a new year's resolution, it's an experiment that's all. At the end of the 8 weeks, detoxed of all sugar I will then be able to clearly know and assess what, if any sugar I bring back into my food choices. (I already know blueberries are back in, I love blueberries but they are one of the best fruits to eat). I'm in no way advertising Sarah's book but if you have an interest in eliminating sugar from your diet you really should check out her book. I'd love to hear from anyone else who has given this a try. I'll keep you posted. Great photos....Sydney always sounds as though it's full of great "foodie" places....delis, cafes etc. My first thought on giving up sugar would be that I just couldn't....on the other hand, I too like a challenge & I'm really interested in the book you mentioned, I think I'll check it out. When I first read it, I thought it said "Salt Melts Cheese".